CLEMSON, S.C. – The Tigers split the final day of the Big Orange Bash on Saturday, defeating Charleston Southern, 3-1 (25-18, 25-27, 25-18, 25-16) in game one and falling to Appalachian State, 3-0 (16-25, 28-30, 14-25). The win over CSU marks Coach Hernesman’s first victory as a Tiger. Leah Perri is the Big Orange Bash All-Tournament Selection for Clemson. This is her second time earning the honor as she recorded 37 kills on the weekend with 30 digs, four aces and as many blocks. 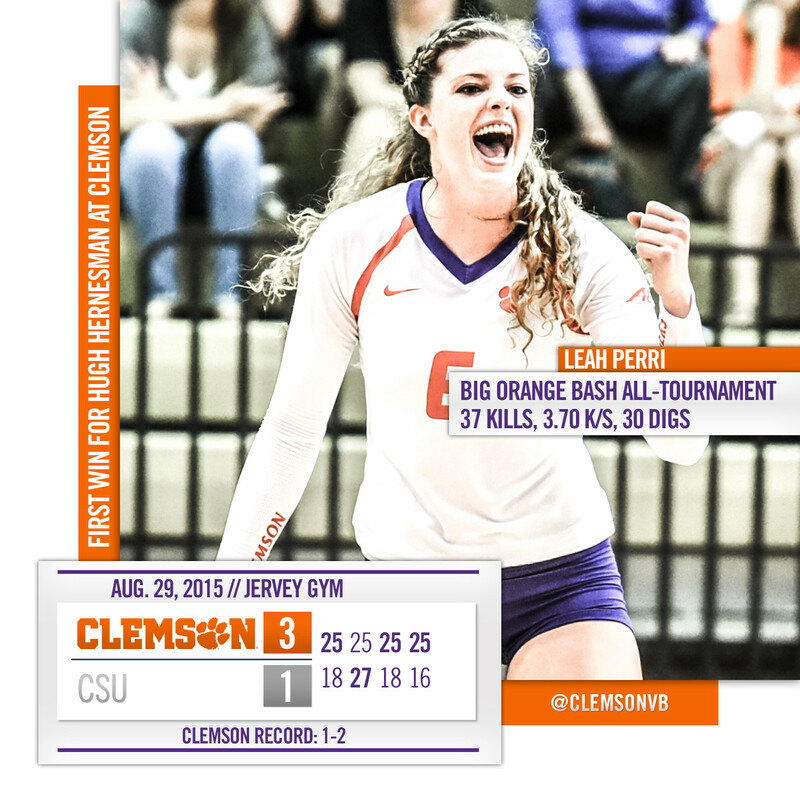 She’s credited with 10 kills against CSU and led the Tigers with 12 kills against Appalachian State. “Overall, I liked the way we competed,” Coach Hernesman said. “We were right in the mix despite having some tough circumstances. If you get a break here or there, we’re looking at a much different situation within the match. So with an overall new system and a lot of new players playing together, I felt like we had a lot of good moments. One of those pieces was Kailey Harvell who showed that her success in her collegiate debut wasn’t a fluke. The freshman outside hitter was impressive against Charleston Southern, leading the team with 16 kills while tallying eight digs as well. Over the course of three matches, she is right behind Perri with 31 kills and 23 digs. Two other freshmen shined on Saturday as middle blockers, Sofia Hruby and Megan McGinley were active on the block and in the offense. “I thought Sofia (Hruby) and Megan (McGinley) really grew this weekend. Their situational blocking got a lot better and we got some good offense from them in the last two matches,” Hernesman said. Hruby matched Perri’s 10 kills against CSU for her first double-digit kill performance while tallying four blocks, two of which were solos. McGinley was also credited with four blocks and connected for eight kills against CSU. The Buccaneers had no answer for the duo as they swung .429 and .409 respectively with just three errors between them. Their offensive contributions carried over to the Appalachian State match as well as McGinley picked up six kills on 13 swings and Hruby recorded four kills on seven swings for a .571 hitting percentage. Sydney Moseley was just a kill away from a double-double against Charleston Southern. She finished the match with nine kills and 12 digs. The Buccaneers also couldn’t find an answer for Keelie Arneson as well as she picked up a season high 23 digs in the contest. Setting the offense of course was Kate Federico who recorded her first 40-plus assist match of the season against CSU with 42 assists on 127 attempts for a .328 conversion rate. She also picked up 25 against Appalachian State and is averaging 9.80 assists per set with 98 total over three matches.